Ten successful years of fund raising by the Lower Mole Countryside Trust were celebrated at their Annual General Meeting on 7 March 2013. The formal business of the evening was followed by ‘Calling All Ecosystems… You need Bugs,’ a beautifully illustrated and attitude changing talk by Gill Sanders on behalf of Buglife, the Invertebrate Conservation Trust. The central message was that without invertebrates’ contribution to pollination, recycling and being the basis of the food chain life as we know it would cease to exist. Who would have thought that without midges there wouldn’t be chocolate or that those irritating wasps that invade late summer picnics are actually to be pitied because they have been made homeless and are starving? After last year’s dismal, wet summer it may take more persuading to love slugs, but who knows? The talk served to confirm to members and guests the importance of the work that the Lower Mole Countryside Trust does in supporting environmental conservation work, providing education and public access throughout North Surrey and Kingston upon Thames. We are extremely lucky that we have so much green open space around us but it takes continued effort to ensure that these essential habitats continue to exist. Since it was set up in 2003 the Trust has raised more than £150,000 to help organisations big and small to make a difference to their surroundings. Grants range from planting hedges in schools, creating and clearing ponds, rescuing ancient orchards, printing leaflets of walks, providing educational information, supporting the Lower Mole Countryside Management Project volunteers in their practical conservation work and many other initiatives too numerous to mention. A recent example of the wide-ranging impact the Trust has on the environment is the Living Woodland initiative. Money supplied from the Trust helped in obtaining a grant from the Heritage Lottery Fund for the appointment of a Living Woodlands Officer. Surrey is the most wooded county in England but in order to maintain these valuable ecosystems they must be managed. Trust money is currently going to 7 woods to support traditional coppice workers in bringing the woodlands back into economic viability which at the same time creates the varied habitats that support the myriad of birds, animals and insects that call them home. A walk through the swathes of bluebells that will soon be carpeting the woodland floors is a potent reminder of the beauty that could all too easily be lost without support. 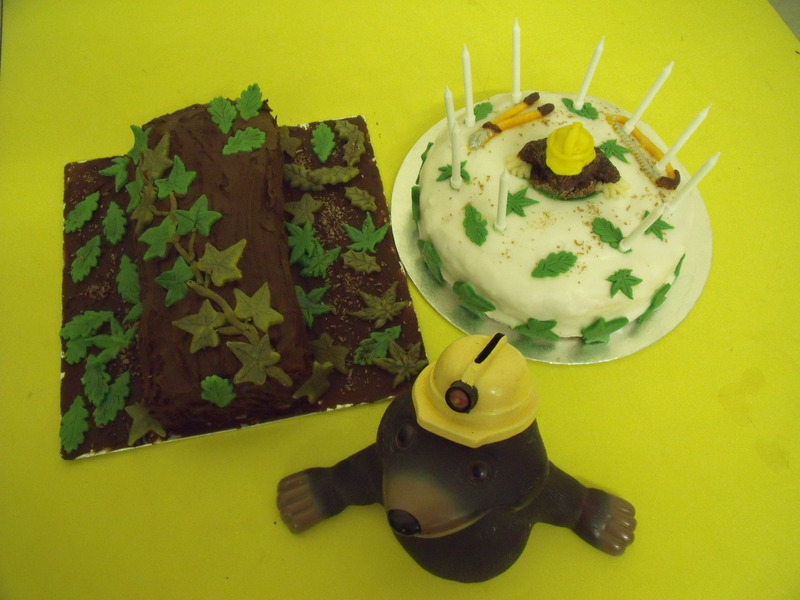 The evening of celebration ended as with all the best birthday celebrations with cake – lots of cake! 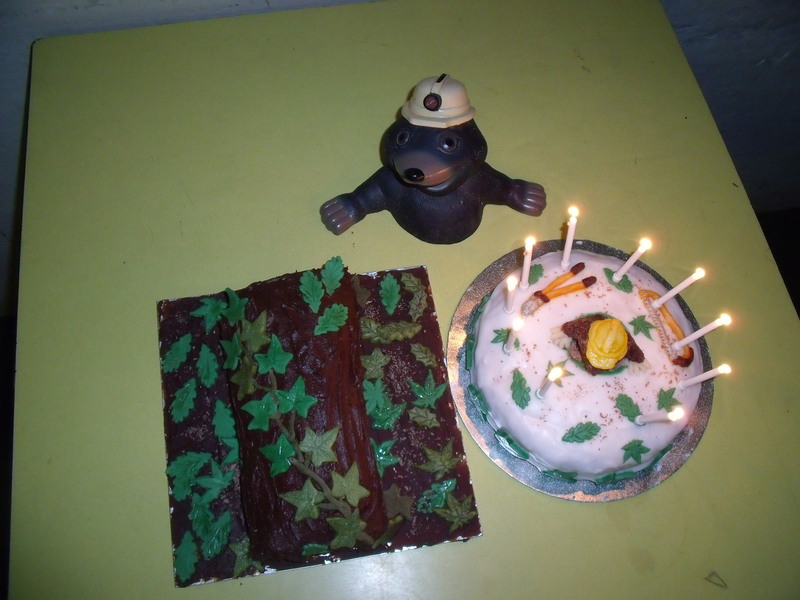 The Mole with two cakes (a 1 and a 0 to make 10) including, if you look carefully, beautiful icing loppers and saw on the white cake – to accompany a little Mole wearing his hard hat. All very familiar to a typical Lower Mole project volunteer! The Trust has agreed to try and raise the funds to restore the pond in Lamberts Orchard at Horton Country Park. The Orchard has seen renewed interest in recent months with the involvement of the London Orchard Project who have held several training days on orchard management, tree pruning and planting new fruit trees at the site. The Pond has completely silted up in recent years so work will include removing overhanging trees, de-silting the pond and construction of a new dam. The Islands form part of the River Mole Local Nature Reserve in Leatherhead. One of the islands was recently purchased by local resident, John Holton, who has undertaken to manage it for the benefit of wildlife. The Trust gave him the funds to purchase a brush-cutter to help with habitat management and will also fund a training course. 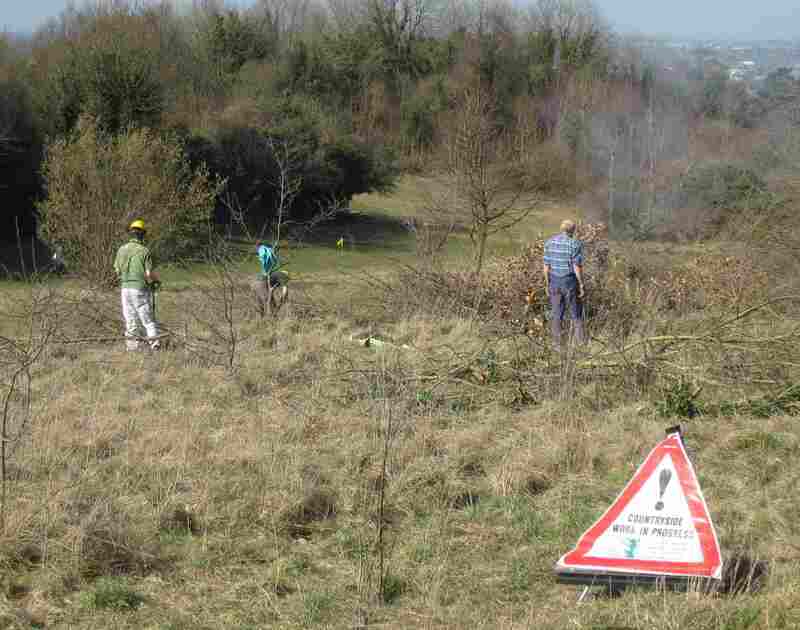 The Trust gave a grant to help fund a programme of works, which had been agreed with Epsom Golf Course linked to the Habitat Management Plan for the area. 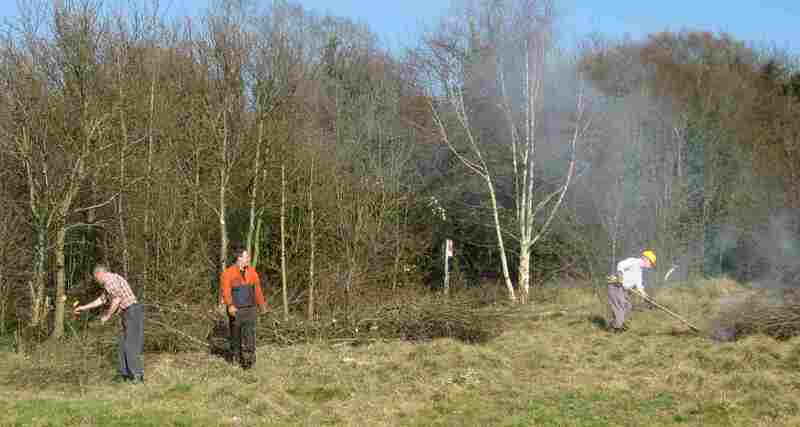 The Lower Mole Project carried out work to restore chalk downland in March 2013, including some new areas on the golf course. This involved clearing scrub on an area of rough grassland by the 18th fairway, which still retains good biodiversity, before the scrub shades it completely. 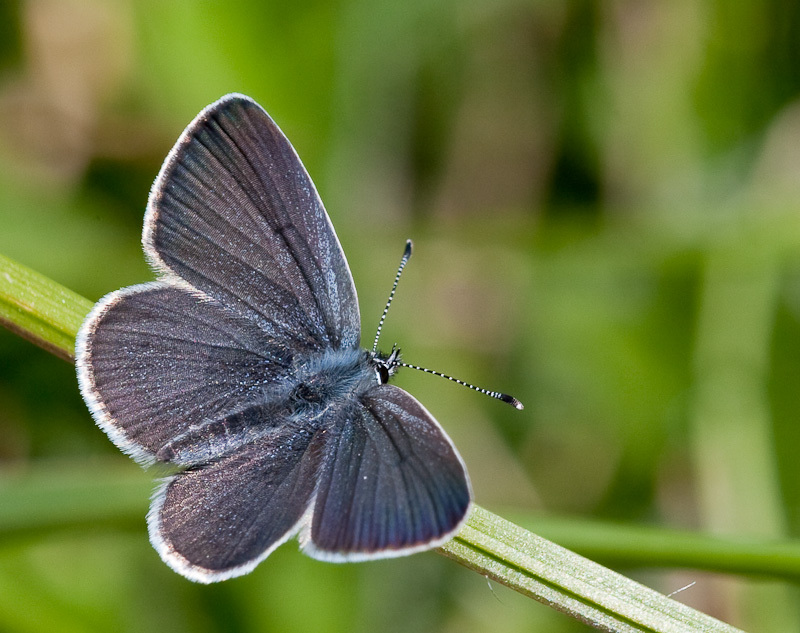 The small blue butterfly, which is one of the reasons for doing the work on the golf course, in order to maintain its habitat.